Managing the Library....How Do You Do It?? Over the years, managing my classroom library has been a struggle. I want to be sure that the students are able to get to the books with ease, can check them out to read at home or in class, AND are held accountable for bringing them back (since we all know that each and every one of the books in the library were purchased with my own money!) I really haven't found the perfect solution to this library dilemma. So here is what I have settled on...for now. My students are free to browse my library during any free time they have (sometimes I even assign it during Independent Work Time as a May Do) and I encourage them to check books out of my library. When they have chosen a book from my library, they then fill out a Check Out Slip. When they have filled out the slip, they simply place it in an index card filer (I know there is a better word for it, but I can't think of it now!) where it stays until they are done with the book. When it is returned, the kids put the date it was returned, and leave the card in the file. Each day, during the end of the day clean up, my Librarians also go through the file. Any books that are not marked returned, the Librarians go and check up with the borrower to determine the status of the book. And really, that is all there is to it. I know it isn't perfect, but it works for now. I haven't had the "missing book" problem that I have had in the past, and it is fairly easy to run, so I am content with it. What system do you have in place to keep track of your library books? PLEASE share, as I know I would always tweek mine if there is something awesome out there I haven't thought of....as I am sure other readers would too! I just posted about my library this week. I have a picture of how I have my students place the check out card in a pocket on a chart. Name and date on it so I can see at a glance who has a book out and for how long. Come take a look. :) I like your pretty check out slips! I am still struggling to find a way to check out books from my library. A few years ago, I had a student bring back 5 books she has checked out 2 years earlier. 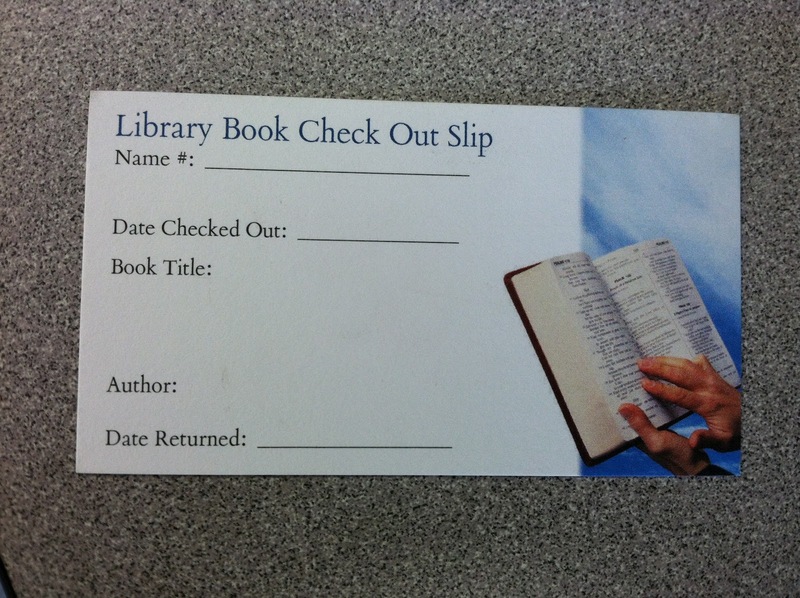 Right now, I just have my students sign a checkout sheet if they take the book out of the room...Maybe your card idea will cut down on the many trips to the library for some of my students. Are your cards from Vistaprint? I purchased the Bookcat software and a cuecat scanner. I spent one summer input ALL my books into it. Now the kids can use the scanner to check out/in books similar to how they do it in the school library. So easy once I've taught it and my librarians manage the returns. I have pockets with index cards in the back of our books. They already have the titles written. Students write their names and then stick the cards in a clear pocket chart. I sometimes have the problem of index cards disappearing when a student realizes the book has disappeared, so I still lose some books that way but not nearly as much as I have in the past. We also find index cards that have fallen out from time to time. Some years are just better than others too. I am SO having the missing book problem this year - DRIVING ME CRAZY!!! I've even started hoarding some of my favourites (Hunger Games) on my own personal shelf just so I can keep an eye on them. Ahh...the perpetual wandering books. I have a few of those that have permanently made their way into my personal library. Goosebumps NEVER seem to stay in my library for any length of time. I posted awhile ago about this FREE website classroom book source that you can use for a library check out system. All you need is a smart phone or a computer. You use your smart phone to scan the barcode or type in the ISBN number into the computer. You will have a record of ALL the books in your library, how many copies, etc. The students also use the computer to check out and check back in books (just like the real library!). You can also set limits to how many books they are aloud to check out. The site also prints reports on levels, genres, etc. Head to my blog to check it out!! That is an awesome site. Thank you for sharing! I use an app on my iPhone and our classroom iPad, call Who Has What? You scan the barcode on the back of the book, the title and picture on the book come up. It automatically puts in the checkout date and you type in the student's name that checked it out. It's amazing!! When they are ready to turn it in, they place the book in the return basket and I return it on the app and place it back in the current basket by a.r. Level. It is the BEST APP EVER!! Try it out if you have a smartphone! ;) happy reading! How did you get it to scan the barcode? I have a binder which contains a form that I keep track of the books checked out. It is a table format with four columns: title, student's name, date checked out, and date checked in. I have a basket where they return their books once they have told me they are returning a book. At least once a week I check with the students to see if they still have the book. They know I'm aware of it still being out and it motivates them to finish reading. My library is organized by baskets which are labeled according to colored dots that represent AR book levels. Each book has a color coded dot on it as well. This makes it easy for me to tell my students which color dot they need to choose from and when I am "re-shelving", they are placed in the appropriate color dot basket. One thing I may change next year is have a page for each student and use the same type of system. This way I can also see how many AR books they have read from my library. I have a simplified version of what you do. I have an Excel table on a clipboard where students write their name, title of the book, and when it's due (2 weeks after checking it out). When they finish a book they place it in a basket and my librarians are in charge of reshelving the books. My library is organized by genre, with labels inside each book. This makes it so much easier and faster for students to do the job of reshelving the books! And it helps my students complete their year-long challenge of reading 1 book from each of 10 different genres. I use to use a program called BookCat for my library of over 5000 books but I wasn't thrilled with it because it really wasn't all that user friendly. I just started using an online free program from Booksource called Classroom Organizer. My students were able to figure out how to use it on their own! In addition to signed the book out on the computer, the students also write their name on the book card and place it in a small 3 drawer organizer. I also have stickers on all my books that have - this book belongs to Mrs. Yingling's Library. My system is similar. All of the library books that were purchased with my money have the library cards that you can buy from Lakeshore for a few bucks a pack. Students are assigned one day a week for "book shopping" and they book shop in the morning after unpacking. (Before a long break all students are given the opportunity to book shop that day.) They sign the book out with their name and the date they signed the book out. It goes in one of those coupon envelopes. Each pocket is labeled with a student's name. That way when a student has too many books out or is not returning books I can easily see what they have at home and send a list of books home to the parents asking them to look for the books at home and return them to school. I have two library monitors. During book shopping each day they put the library cards back into books that have been returned and put the books away. Usually the know just by looking at a book which one of their classmates was reading it and can easily find the card to put it away. Sometimes they ask around first, but it usually require no attention from me. There have been times when books have been "missing" for extended period of time. I don't get to go through the cards and see how many students have out often. But when I do I will let students know, "you have too many books out" or "this book has been out for too long" and they will have to borrow from the classroom books (older books that I inherited when I moved into the classroom that belong to the school) until they return my books. Usually in a day or two they seem to find my books at home. I have hundreds of my own books and this year I think maybe 2 are actually missing. Who knows, maybe they'll turn up in June! There seems to be several versions of this in your comments, but a colleague of mine just got an iPad and there's a free (!!) website that has a service that lets you log in all the books in your classroom library and then use it for the students to check out books, eliminating a paper trail! The best part - there's an app that you can just scan the ISBN number and it will enter the book. I agree with Jen, http://classroom.booksource.com/ is a great system. Since it is web based, it travels with you. Another great thing, other than it is free, you can upload your students into the system and they are able to select their name, select a book by either entering the name or scanning it, and check in or out the book. You can scan books by using the app or purchasing a scanner. I purchased intelliscanner (www.intelliscanner.com), and though it is a wonderful program which allows you to track about anything with a bar code, you have to export databases to use from one computer to another and it does not load the title instantly. What I have done is combine the best of both programs. I use my scanner and blank adhesive bar codes (these come in handy since Scholastic is known for duplicating bar codes and / or not printing bar codes on books - especially if purchased in a set) from intelliscanner and track the class books in booksource. I still use my intelliscanner to track my professional and personal books at home. I am currently working on my classroom library. I have been going through and putting Lexile Levels in all of my books. I then plan to organize them by genre like you have. My question for you and others out there that have been using your library with a check out system, how often do you allow students to check out books? Once a day? Week? The past two years I have hated the way my classroom library has gone. Students would get a book, read a few pages, go back, get another, read a few pages, etc. This drove me crazy. Even using a type of check out system this was still going on. Any suggestions? Thanks. Your site it great. It is definitely one I will be bookmarking.